LOS ANGELES—The Board of Trustees of the J. Paul Getty Trust announced today that James Cuno, recognized both nationally and internationally as a noted museum leader and scholar and an accomplished leader in the field of the visual arts, has been named president and CEO of the J. Paul Getty Trust. Dr. Cuno, who comes to the Getty after serving as president and Eloise W. Martin Director of the Art Institute of Chicago since 2004, will assume his position August 1. Prior to directing the Art Institute of Chicago, one of the world’s leading encyclopedic art museums, where in 2009 he presided over the opening of the museum’s Modern Wing, Dr. Cuno was the director and professor of the Courtauld Institute of Art, University of London, from 2003-2004; the Elizabeth and John Moors Cabot Director of the Harvard University Art Museums and professor of the history of art and architecture at Harvard from 1991 to 2003; director of the Hood Museum of Art, Dartmouth College, from 1989-1991; director of the Grunwald Center for the Graphic Arts, UCLA, from 1986-1989; and assistant professor of art, Vassar College, from 1983-1986. 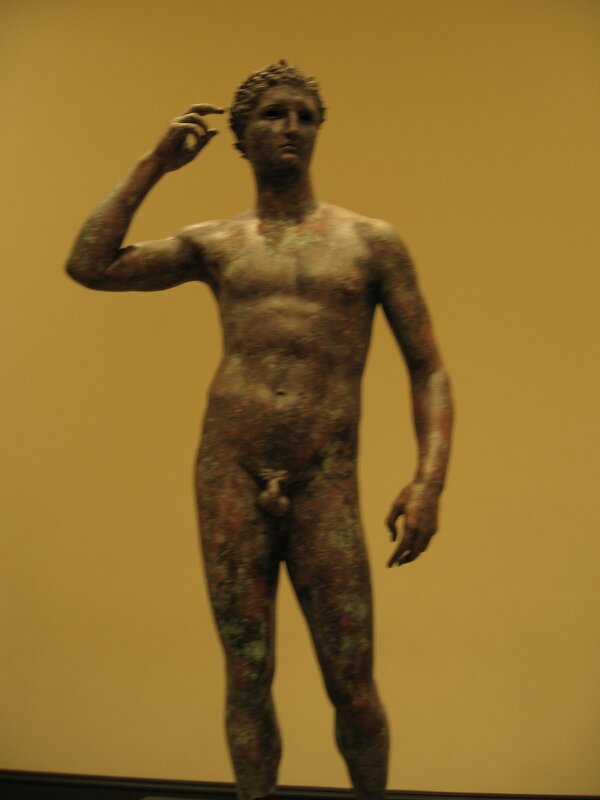 There are many tasks involved in this new position of course, but the one I’ll be closely watching will be how this will impact the Getty’s ongoing dispute with Italy over this ancient bronze. PRESS RELEASE: James Cuno , PRESIDENT AND ELOISE W. MARTIN DIRECTOR OF THE ART INSTITUTE OF CHICAGO, NAMED PRESIDENT AND CEO OF THE J. PAUL GETTY TRUST, (2011), http://getty.edu/news/press/center/james_cuno.html (last visited May 9, 2011). I just listened to a very interesting story on Marketplace, discussing the pre-Islamic Afghani objects which are currently touring the United States. Two points. First, Afghanistan still is badly in need of funds and resources to protect sites; and second though the tour raises Afghanistan’s international profile and has a number of important benefits, it may also raise the desire of collectors to buy similar objects. This puts pressure on the limited enforcement mechanisms. Of course one possible solution is to dissuade collectors from buying these items, or we might even encourage source nations to consider marketing some of their surplus antiquities (a wildly controversial solution to be sure). More on this travelling exhibition here. There has been concern in the past that Afghanistan didn’t quite get a fair deal out of this tour, though I think the piece speaks to this point. When Egyptian antiquities tour, the public associates Egypt with ancient civilizations. What does the American public currently think about when they think about Afghanistan? As the Afghan official pointed out, defining success for this Afghan tour is far different. Lee Rosenbaum, arts journalist and fellow blogger at culturegrrl has an Op-Ed in today’s LA Times titled “Make art loans, not war” in which she argues for increased loans from Italy and Greece, a more collaborative relationship between North American “Universal” museums, and an increase in what she calls “citizen archaeology” along the lines of the portable antiquities scheme in England and Wales. It’s a well written piece, but it strikes me as a compilation of a lot of other scholarship. I suppose it’s a journalists prerogative to take the work of scholars and researchers and reconfigure it in a more digestible (i.e. better written) form, but it does strike me as a bit unfair that she gets to take credit for some ideas which have been persuasively and compellingly articulated elsewhere. I’d like to point out some of the theoretical foundations for the ideas that Rosenbaum articulates. John Merryman has long been a champion of “cultural property internationalism“, and Kwame Anthony Appiah also made a compelling argument for a similar kind of idea in his recent work, Cosmopolitanism: Ethics in a World of Strangers. Antiquities leasing is a particularly interesting idea, and it’s one that’s received some interesting attention recently, including an article by Peter Wendel, a law Professor at Pepperdine University, as well as a recent working paper by Michael Kremer and Tom Wilkening who argue from an economic perspective that long-term leasing of antiquities would allow source nations to earn much-needed revenue from their antiquities, but would preserve their own long-term ownership interests. I’ve even argued here that the agreements forged by the Getty, the MFA Boston, the Met, Princeton, and Yale with Peru are essentially leasing agreements between the two sides. Clearly, the custom established by these agreements leads to the idea of leasing as a workable solution to these intractable disputes. More controversially, I believe that source countries should consider training and licensing citizen archaeologists. The antiquities police can’t hope to end all the looting or shut down the black market completely. But if those who make finds are compensated for reporting them and perhaps trained to help excavate them, midnight marauders who mangle masterpieces and destroy archaeological context may become less numerous and destructive. One precedent for the “if you can’t beat ’em, join ’em” approach is Britain’s financial compensation of metal detector-wielding amateurs who turn over significant finds including gold, silver and prehistoric objects to the proper authorities. This is a subject upon which I’ve written, and what she’s referring to here is the Portable Antiquities Scheme, and the Treasure Act. Their flickr site is particularly interesting, which is where I found the image above of a Roman horseman found in Cambridgeshire last year. The PAS operates only in England, Wales and Northern Ireland. Scotland is not a part of the scheme. Unfortunately the PAS is in danger due to budget restrictions and funding for the London Olympics. I discuss the PAS and the idea of rewarding finders of objects in some detail in my recent article WHY U.S. FEDERAL CRIMINAL PENALTIES FOR DEALING IN ILLICIT CULTURAL PROPERTY ARE INEFFECTIVE, AND A PRAGMATIC ALTERNATIVE, 25 Cardozo Arts & Ent. L.J. 597 (2007), available on Lexis and Westlaw. I think she may be under a mis-impression regarding the scheme. The PAS encourages voluntary reporting of finds for those objects which fall outside the scope of the Treasure Act. The scheme has created a massive community archaeology project for objects which are found on private lands and do not belong to the Crown. There has always been a requirement in England and Wales to return valuable metal objects to the Crown, however the introduction of the scheme dramatically increased compliance with the law. Based on this, I argue that it’s not enough for a source nation to declare ownership; to effectively protect sites it must also erect appropriate mechanisms to promote compliance with those ownership declarations. When a metal detector finds a valuable piece of gold on private land (detecting on scheduled monuments is strictly forbidden) the finder is entitled to an award, which thus encourages the reporting of finds. However, such a system may not work in all source nations, as you do not want to encourage haphazard looting. As a result the PAS and the Treasure Act are important policy solutions to consider, but are not a cure-all for the antiquities trade. In short, there has been a great deal of attention placed on the return of objects to Italy, but nearly all these returns, and certainly the most valuable and significant objects, were returned based on substantial evidence, often photographs, which indicate the objects in question had been illegally excavated. The Medici Conspiracy details the investigation. These returns to Italy are the product of a massive investigation of a single commercial stream (albeit a substantial one) from Italy to North America. The challenge for cultural policy makers is to think about the other source nations and other transactions. Rosenbaum rightly points out some of the innovative potential solutions to these dilemmas, I just think it’s regrettable that the Op-Ed forum doesn’t allow her to reference some of the important work she may have relied on to formulate her thoughts. Rosenbaum responds to me here, and also posts reactions from a “prominent curator” and David Gill. Cultural property internationalism is the idea that cultural objects have a value for all mankind. Unfortunately, sometimes taking that position can produce unsatisfactory results for source nations. Robin Pogrebin has an interesting article in today’s New York Times on the traveling exhibition of Afghanistan’s Bactrian Gold. The National Geographic Society has reached a deal which pays $1million to Afghanistan for display of the hoard, plus 40% of all profits. Sounds like a great deal for Afghanistan to generate revenue and engender some international appreciation for its heritage. Lynne Munson, the former deputy chairwoman of the National Endowment for the Humanities, which helped finance the cataloging of the Afghan treasures, said the arrangement would leave Afghanistan with “40 percent of absolutely nothing,” because expenses would be significant. She said she had ceased working for the endowment in 2005 because of internal conflicts within the agency over arrangements for the show. The protocol accord signed over the weekend says that the exhibition revenue going to the Afghans will be derived from the fees paid by the museums as hosts of the show and from corporate sponsorships. It does not guarantee them proceeds from ticket, catalog or merchandise sales. A similar exhibition by the Egyptians in 1994 earned that country over $10 million in every city visited. Some of the pieces were displayed in Paris and Turin, but the details of that exhibition were not made known. I don’t know very much about how much a source nation like Afghanistan should expect to clear in an exhibition like this. Thomas Hoving and Lynne Munson certainly feel Afghanistan got slighted. Though the Egyptian exhibitions seem to indicate that Afghanistan should have held out for more money, this may also serve a very important cultural mission for Afghans. Many foreigners view that nation as a hostile place with mountains and terrorists, or the source for much of the heroin trade. In reality it was once a very important stop on the silk road and the home to some very advanced ancient civilizations. Everyone knows that Egypt has a great archaeological heritage, perhaps this exhibitions will change the perception of Afghanistan and allow other exhibitions in the future to garner more funds for Afghanistan in the future. There are so many problematic aspects surrounding Robin Pogrebin‘s story in yesterday’s NY Times about the allegedly “unconscionable” financial arrangements between the National Geographic Society and the government of Afghanistan, for a proposed tour of that country’s Bactrian hoard, that it’s hard to know where to begin. Critics cited in the article charge that Afghanistan is being shortchanged in the deal although, from the Times account, it’s difficult to ascertain exactly what the financial parameters of the arrangement are.